When reading Franco Moretti ‘s “Graphs, Maps, and Trees”, I felt that I saw him focus on two main points. First of all, he brings up that scholars of literary history tend to spend plenty of time documenting the classics of a given period, buy pay almost no attention to the average, everyday works that were published in said period. The second point regarded his philosophy of studying stories and trends in stories by using, “graphs, maps, and trees”. On one hand, reading his first point makes perfect sense. There seems something almost perfectly human and expected in people focusing on the major works of a given era rather than what was written and read from week-to-week by the ordinary people. We are a big event kind of species. And yet, somehow, this seems truly tragic. How can a person be a real historian if they do not have some knowledge of what reading a book for the average person would look like? In this sense, his book is not just a description of a style of analytical thinking. It is a bold call to action for historians to delve into the past and really immerse themselves in the writings of the time. The second part of his argument brings to mind the Robin Williams movie, “Dead Poet’s Society”. In this movie, at the beginning of the school year at an elite prep school, Williams, playing the unorthodox English teacher of a group of young men, has them tear out the pages of their literature books that teach students how to judge the greatness of a work based on charts. As this (and the rest of the movie) make clear, Williams character greatly prefers the qualitative over quantitative. However, there is a place for everything, and this work by Mr. Moretti would seem to provide the answer. Fine, he says. You can’t use quantitative methods to analyze the book itself on a merit basis. But you can to find its place in history, to chart not only the progression of actions within the book, but the place of the book in the genre predominant of whatever time the book is from. This is what I approve most of his system…the reliance of these charts for analyzing trends. In previous posts, the method of using pictures to tell history as a future way of communicating it on the internet was discussed. While the chart system Moretti proposes is not something that could only come about in the internet age, it does make said idea more in depth. If we truly are living in the age of the database, this system would seem perfect for taking that information and molding it to tell the story of history. I have a love/hate relationship with Google My Maps at this point. Of course Google Maps has revolutionized the way humans navigate the world (for better or for worse) and the satellite imaging of pretty much every corner of the Earth, except for the poles, is remarkable. 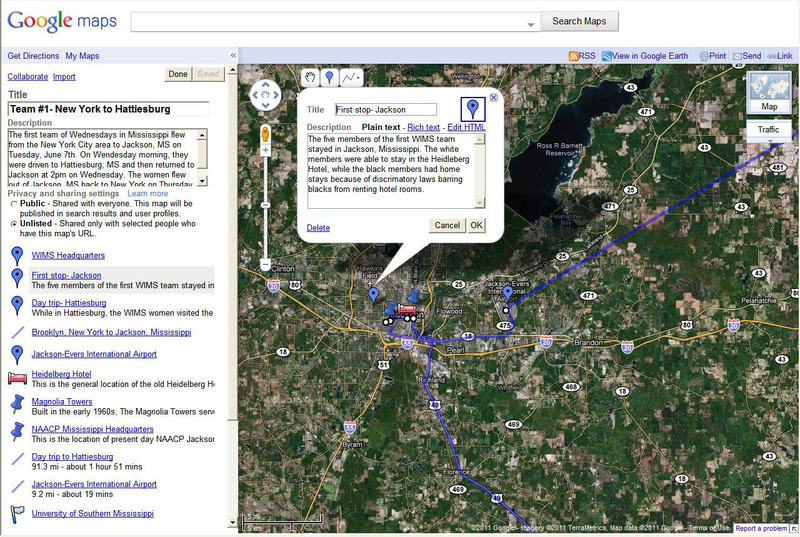 But when it comes to creating your own map using the preexisting Google maps, things get a little sticky. I decided a while ago to use Google My Maps for my digital project called “Mapping WIMS.” I’ll use the experience I’ve had working on my project as a basis for this practicum. First and foremost, you’ll need to have a google account. After signing in, navigate to Google.com/maps, which is just the regular Google Maps site. You’ll see directly under the Google maps title bar “My Maps”, on the right. Click on this, then click “Create New Maps”. First you’ll be promted to create a title for your map, add a description if you want and, more importantly, choose if you want this map to be public or unlisted. Making a public map would be better for doing some sort of project, where an unlisted map would be better for sharing specific directions with trusted parties. When you go about creating a map, of course you’ll want to have points of interest. The place mark tool can be used to identify those points and you can change the icon to a variety of generic symbols. If you have a specific address that you want to put a place marker on, simply type the address into the search bar above and when Google Maps locates it, look to the sidebar on the left of the screen that shows the destination bubble “A” and click on “Save To…” on the bottom line of text. This way, you can choose a map to save this location to without having to manually locate it. Along with the place marker icon, you can add a title and caption, which especially for a project map, is very useful. You can provide as much or as little information as you wo uld like. By clicking on the “rich text” option in the caption edit bubble, you can import pictures from URLs and hyperlinks. This makes the map much more interactive and illustrative. You can choose three different types of ‘lines’ to use in your map. There is a straight line, a line that snaps to roads, and then a ‘shape’ line, where you can sort of triangulate an area of interest. The lines function, in my opinion, is actually quite disfunctional. Sometimes it is hard to get the line to begin drawing, or worse, to stop drawing. If you try to click away from drawing a line, your map will go flying in another direction and you could end up in Canada before finally having to abandon the effort altogether. Also, there is no function to simply draw a line between two place marks. You have to do it manually, and if the distance between the two is far enough, it is hard to be accurate. Often times, it is difficult to even start a line on a place mark, because the program seemingly assume you’re trying to switch modes and modify the placemark instead of start the line. It can get really messy and extremly frustrating. If you’re a casual My Maps user… thats about the long and the short of it. I haven’t had success embedding these maps, although that may simply be a testament to my internet tech skills. There is, although a quick and easy feature for getting your business on a Google Map….which I did with ease. Google even offers to send you a post card when the site is officially “on the map” as they say. The website for the Euclid Corridor History Project is a digital extension of a physical effort by the city of Cleveland. “The goal of the project is to capture, preserve, and archive the stories of these Euclid Avenue neighborhoods and the people that live within them though audio-based oral histories.” In order to do so, the Greater Cleveland Regional Transit Authority (RTA) began the construction of a bus rapid transit (BRT) line running from Euclid Avenue to East Cleveland. Additionally, the project encompassed an entire rebuild of not only the storefronts on Euclid Avenue, but the sidewalks and landscapes as well. Digital kiosks, designed by Cleveland State University, were installed along the way to serve as “curators” for the historical sites. With that said, the Euclid Corridor History Project online is designed with tourists in mind. In fact, it is actually a prototype for the interactive kiosks that are part of the physical project. While the website is not in working order, it appears that it will be very easy to navigate: the tabs are clearly labeled, as are the links available in each. The “Art and History” tab allows the user to click onto specific segments of the BRT, divided by neighborhood, and to select individual stops on the line, e.g. the Cleveland Museum of Art. Choosing a stop pulls up a window containing that particular site’s history, as well as photographs and audio files (such as oral history) pertaining to it. The remaining tabs are strictly informational in nature. The “Transit Info” tab provides links to information for tourists wishing to ride the BRT, such as trip planners, maps, schedules and farecards. Likewise, the “Events and Attractions” tab is pretty self-explanatory. It is linked to travelcleveland.com, a website that announces various events and attractions coming to the Cleveland area. One can also sign up for Cleveland eNews, a service which sends automatic updates of these events. The final tab is dedicated to Ideastream, a partner of the Euclid Corridor History Project, who manages the Ohio Public Radio and the Listening Project 2007. The Euclid Corridor History Project seems like a great way to preserve the history of the Cleveland area and to disseminate that information in an interesting, interactive way. Such a project, with an emphasis on the virtual and physical intersections of history, allows each and every individual to be involved in its development. Likewise, the stories are not told simply by wall placards or tour guides; there is an opportunity for the voices of those who were present to be heard through the digital portals while visitors see the history firsthand. All in all, the Euclid Corridor History Project, both online and in its physical context, is a successful means for engaging with history. In Julie Meloni’s article, she reviews the Gowalla site and discusses how its features can be applied as a supplement towards education and visitor experience at museums. At first look, Gowalla is a location-based social network, much similar to the Foursquare application. Users on their mobile devices “check-in” at spots near notable locations, such as landmarks, statues or building sites, receiving a badge/item to add towards your account’s collection (these may be redeemed for real-life prizes). Gowalla comes with challenges to get special badges and users can create customized trips to provide other users tours that target specific sites to visit. The ability to create these custom trips becomes a useful tool for education. Because any location can be marked for visit on the trips, these places can range from favorite stores, to little-known historical markers and sites; this allows users to reconnect the history of special locations to others. As each location has a short paragraph with information about the site along with photos made by other users, Gowalla can help bring more exposure about these places to other who may not know about them. Meloni suggests several ways that Gowalla can be used with museums to enhance the visitor experience. These suggestions include linking objects in an exhibit to its place of origin (and vice versa, where going to a location may link the visitor to related examples at nearby museums), creating specialized exhibits to collaborate with Gowalla trips, and creating specific bonus badges that are earned in addition to the initial badges from the exhibit. Gowalla can become a great tool in uncovering historical sites and locations to both students and visitors, providing a nice interactive approach in combing both sightseeing and learning into a single tour or “trip”. Other than the ways that Meloni suggests in her article, can you think of other ways that Gowalla could be applied to learn about locations? The subculture group known as hackers has constructed a polarizing image ever since its emergence in the early 60s.From forging new paths in the early stages of programming to causing fear through created virus, worms, and hacked databases, hackers are seen with both pride and loathing in light of their contributions and work within the internet/computer community. How the media constructs the public perception of hackers also reflects their actions, as seen in movies such as War Games, Hackers and the Matrix. Because of the power of media in shaping public perspective, we are often left with an image that is not representative of the group. In my print project I want to look into what hackers are about, tracing their origins alongside the development of computers and the Internet. I intend to look at how the changes in how the public viewed hackers through the media, such as movie depictions. Some of the literature I will use are Steven Levy’s Hackers: Heroes of the Computer Revolution, and articles that chronicle the acts of such hackers (for example, the coverage of Anonymous and their actions against government/corporate websites). My focus is to see how their principles influence their actions and attitude towards digital information, and how their actions in turn influenced the public. With the expansion of digital media and increased use of the internet to publish and share information, hackers are again rising to prominence as the activists and champions of free information, striking out against those they believe are a threat towards their idea of openly shared knowledge in the public community. I hope to show that despite the changes in their image over time, hackers remain true to their core beliefs and change only their methods of expressing their beliefs, remaining an influential force within the online community.